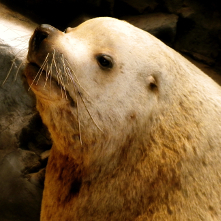 The Steller sea lion, also known as the northern sea lion, is the largest member of the Otariid (eared seal) family. 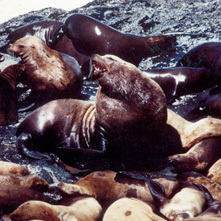 Steller sea lions exhibit sexual dimorphism, in which adult males are noticeably larger than females and further distinguished by a thick mane of coarse hair. The coats of adult males and females are light blonde to reddish brown and slightly darker on the chest and abdomen. 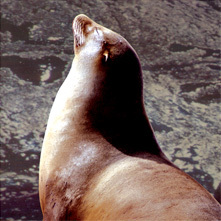 The light coloration is still visible when the body is wet, which is different from many pinniped species. Like other pinnipeds, their coat of fur molts every year. Both sexes also have long whitish whiskers, or vibrissae, on their muzzle. The flippers and other hairless parts of the skin are black. The fore-flippers are broader and longer than the hind-flippers and are the primary means of locomotion in water. On land, sea lions, unlike true seals, can turn their hind flippers forward for walking. Steller sea lions forage near shore and pelagic waters.They are also capable of traveling long distances in a season and can dive to approximately 1300 ft (400 m) in depth. They use land habitat as haul-out sites for periods of rest, molting, and as rookeries for mating and pupping during the breeding season. At sea, they are seen alone or in small groups, but may gather in large rafts at the surface near rookeries and haul outs. They are capable of powerful vocalizations that are accompanied by a vertical head bobbing motion by males. Steller sea lions are opportunistic predators, foraging and feeding primarily at night on a wide variety of fishes (e.g., capelin, cod, herring, mackerel, pollock, rockfish, salmon, sand lance, etc. ), bivalves, cephalopods (e.g., squid and octopus) and gastropods. Their diet may vary seasonally depending on the abundance and distribution of prey. They may disperse and range far distances to find prey, but are not known to migrate. 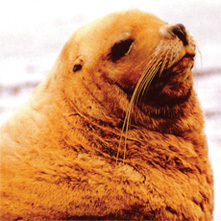 Steller sea lions are colonial breeders. Adult males, also known as bulls, establish and defend territories on rookeries to mate with females. Bulls become sexually mature between 3 and 8 years of age, but typically are not large enough to hold territory successfully until 9 or 10 years old. Mature males may go without eating for 1-2 months while they are aggressively defending their territory. Females typically reproduce for the first time at 4 to 6 years of age, usually giving birth to a single pup each year. Adult females, also known as cows, stay with their pups for a few days after birth before beginning a regular routine of alternating foraging trips at sea with nursing their pups on land. Female Steller sea lions use smell and distinct vocalizations to recognize and create strong social bonds with their newborn pups. Pups have a dark brown to black lanugo coat until 4 to 6 months old, when they molt to a lighter brown. By the end of their second year, pups are on the same color as adults. Females usually mate again with males within 2 weeks after giving birth. Males can live to be up to 20 years old, while females can live to be 30. 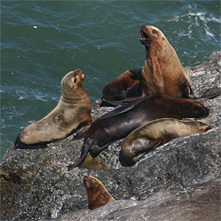 Steller Sea Lions are members of the Otariidae family - or eared seal. 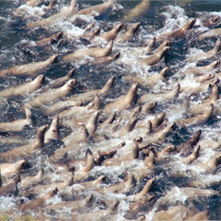 An average herd of 200 are living in the Sea Lion Caves region. Sea Lions are warm-blooded mammals. Sea Lions are pinnipeds - literally, feather footed. They have finlike members for propulsion. Sea Lions are carnivorous, eating mainly bottom fish such as skate, small sharks, squid, and various species of rock fish.